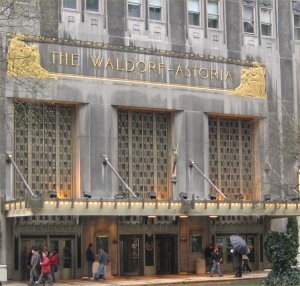 Sarah and I set of for the city that never sleeps, New York.We were ready to visit New York, on several occasions, waiting for the right deal.We got a 3 night trip to New York, flying from Manchester and staying at the Waldorf Astoria. 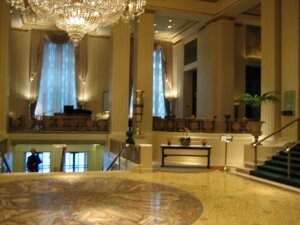 The Waldorf harks back to a different time in history.It was a lot like in the film Titanic, when you see how the people in first class are treated. 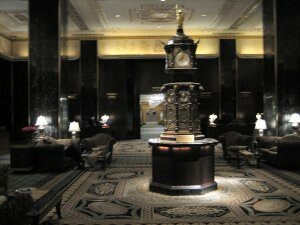 The lobby bar/restaurant, is one of the most famous sights in New York.When I visit a City, I normally make a list of all the places I want to see.This was the first trip where one of those places was actually the hotel where I was staying. 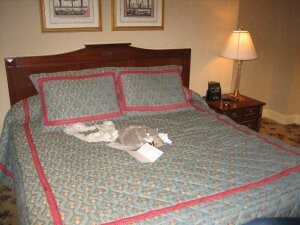 Our room was very comfortable and stylish.It featured a walk in wardrobe, Stereo television, and broadband (I was able to continue working on my web site whilst there).Our room was cleaned/turned down 3 times each day and was spotlessly clean. I had forgotten my plug adapter, when I called down for one, it arrived 5 minutes later, and they called again 20 minutes later to confirm I had received it.It lacked Tea and Coffee making facilities, when we asked about these, they seemed astounded that a guest of theirs would choose to make their own coffee.They advised us to call down, and that they would make us a cup of one of the 51 types of Coffee they had. 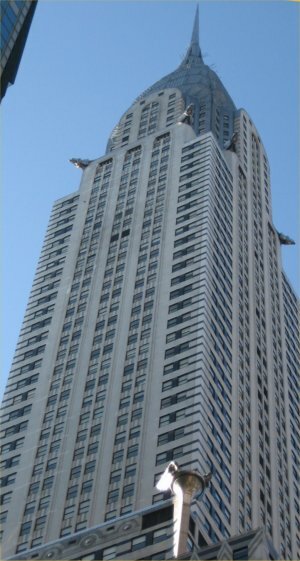 The world famous Chrysler building.At the time it was built, it replaced the Eiffel tower as the largest man made structure on earth.Chrysler accused the Architect Van Allen of taking bribes and refused to pay his fee (this ruined him, and ended his career).Although Chrysler lost control of the building in the 1950’s it still kept its original name. 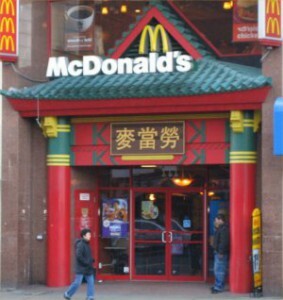 As we walked through Little Italy and Chinatown on our way to lower Manhattan, we saw this Chinese McDonalds. The Brooklyn Bridge with it Gothic Arches. During its construction, many people died from the “bends” when they were working bellow the water surface in pressurized chambers. 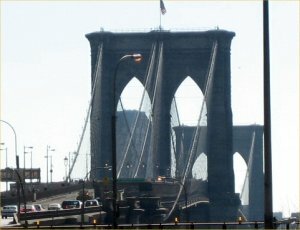 People travelling across from Brooklyn to the island.Brooklyn is the only district of New York that isn’t in Manhattan (when New Yorkers refer to the city, they mean Manhattan Island).It is reckoned that 1 in 7 famous Americans are from Brooklyn (by the people of Brooklyn at least ! 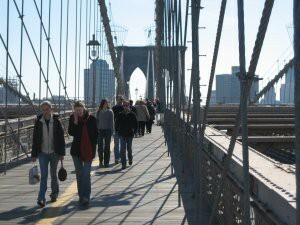 ).There were many people jogging across the bridge. 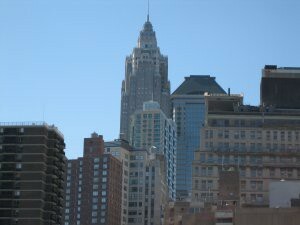 View from the Bridge, overlooking the financial district . 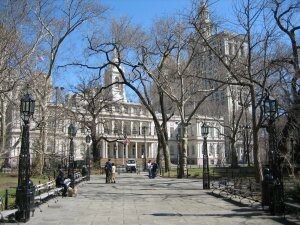 City Hall.The Mayors residence, and the sort of Town Hall of New York.This is where Thomas Jefferson read the declaration of independence. 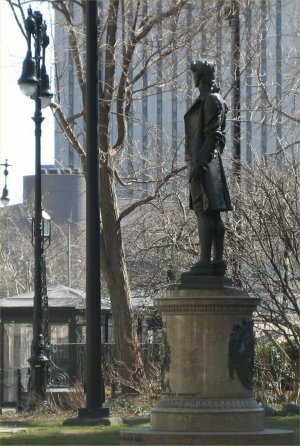 In the grounds of City Hall, A statue of Nathan Hale.During the war of independence, he volunteered to act as a spy and go behind British lines to report troop movements.He was caught almost immediately and hanged.His famous last words were “my only regret is that have only 1 life to give to my country”. 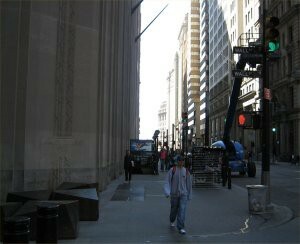 The top of the most famous financial area in the world – Wall Street.Security is very tight, the large rocks on the bottom left of this picture are designed to look like modern art, but are also there to stop suicide bombers from driving vehicles into the the street. 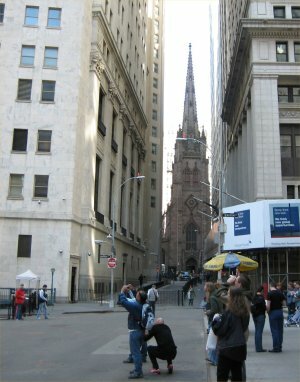 A view down the length of wall street, showing the Trinity Church.I was surprised at just how small, wall street was (it was about 30-40 feet wide) I had imagined somewhere the size of Broadway.It was a Saturday, so none off the money people were around. 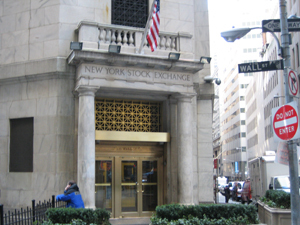 The rear entrance of the New York stock exchange, the largest stock exchange in the world.Once again, there was perimeter security and an armed guard at all times. 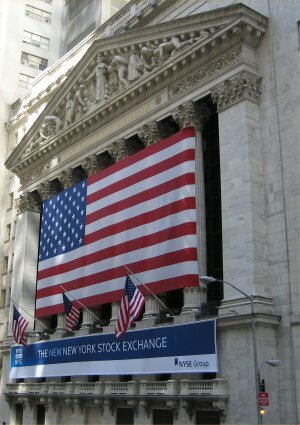 The front of the New York Stock Exchange.The basis of the NYSE was the Buttonwood agreement (so named as it was signed under a buttonwood tree), originally signed by 24 brokers on the 17th of May 1792.The first company listed on the exchange was the Bank of New York (it now has 2,800).It is far and away the largest Stock Exchange in the world, by share value and the 2nd largest by number of companies quoted. The Trump Building (not to be confused with the Trump Tower).When built, was in competition to be the tallest building in the world, with the Chrysler building.In the end, the Chrysler building won, as a 185 foot spire (delivered and assembled in secret) was added to the top.Both buildings were beaten by the empire state building completed 18 months later. 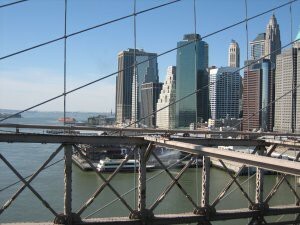 Here the Trump Building is visible from the Brooklyn Bridge.At first I thought it was the Empire State building, which I found out later, is in the completely opposite direction. 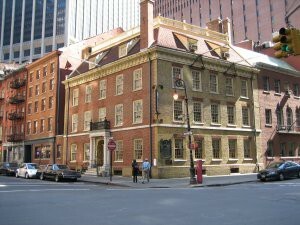 When we saw this old Pub near wall street, we were thinking of popping in for a drink.This is actually the Fraunces Tavern Museum of revolutionary history.We found out, that during the war of Independence, the Americans fought from Manhattan island when the British arrived in ships, with a force twice the size of the Spanish Armada. 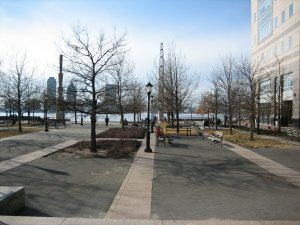 Battery Park.It was a nice park, with lots of harmless street hawkers selling pictures and I Love NY T-shirts and baseball caps.I took the opportunity to get an authentic NY hot dog.In the center of the park, was a memorial to people who died in the Korean War. 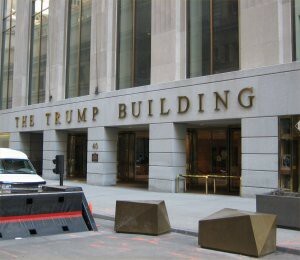 It was a clever design featuring a metal obelisk, with a hollow cut out in the shape of a soldier. Its a kind of new angle on unknown soldier memorials, as the sculpture implies, insert any solider here. 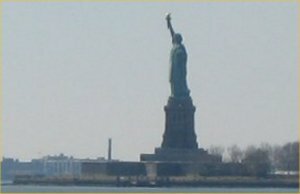 The statue of Liberty photographed from Battery park.The queue for the boat to Ellis Island where the Statue of Liberty is located, was a quarter of a mile long, even on a work day.Sadly, on short adventure trips like this, there was no time to queue. 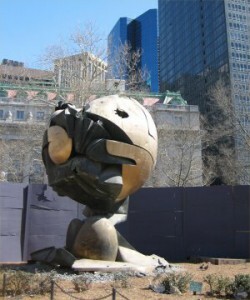 I saw this sculpture in Battery park, it had a plaque underneath it, which said:For three decades this sculpture stood in the plaza of the world trade center.Entitled “The Sphere”, it was conceived by artist Fritz Koenig as a symbol of world peace.It was damaged during the tragic events of September 11, 2001, but endures as an icon of hope and the indestructible spirit of this country. The Sphere was placed here on March 11, 2002 as a temporary memorial to all who lost their lives in the terrorist attacks at the word trade center. “The draw of New York City has been strong and constant for centuries. People from all over this country and the world have made incredible journeys to come here, to live here, to experience the indescribable force of life that is found around every corner. New York City’s was built on an Island of bedrock, A strong foundation for a soaring city. 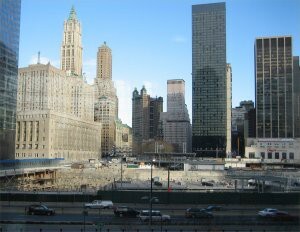 The World Trade Center attacks exposed the Islands natural bedrock once again, reminding us all of the city’s indestructible core. 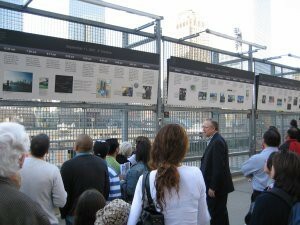 The viewing platform had gone, and it was difficult to see the site, as work was about to begin on the remembrance tower, the following day. 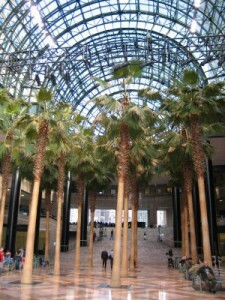 A view was possible from inside World Financial Center. It was very hard to stand there, and not feel angry. Some people have said its wrong to photograph the area, as its a graveyard. 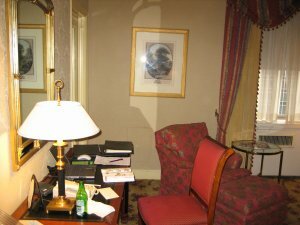 I took this picture because I want to remember. 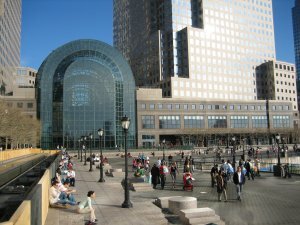 Outside the World Financial Center. 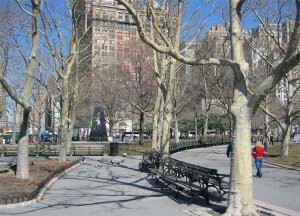 It was a nice day, and people were relaxing, pushing prams reading newspapers etc. On the forecourt facing towards the Hudson river, the views were spectacular. We had coffee, which in New York is always excellent. Inside the World Financial Center they have somehow managed to grow Palm tree’s. We walked back up through Trebeca and Soho. Trebeca stands for Triangle beneath the canal, indicating an area on a map of New York. 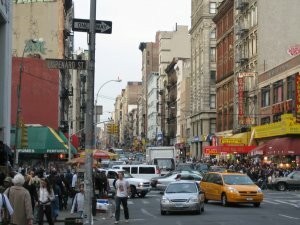 These places had once been run down, but are now, quite trendy shopping areas, with many people living in loft apartments. To illustrate how busy it was, I went into a coffee house. There were 18 people queuing in front of me just to use the toilet. 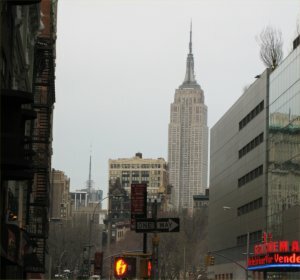 We continued up, and came to the Empire state building. 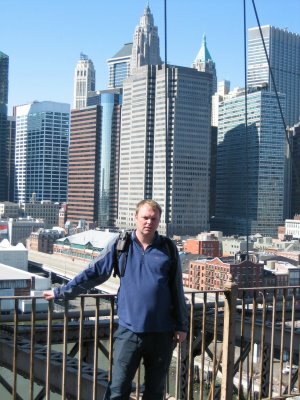 Despite its age (and that people remember it most from King Kong) its still the tallest brick building in the world.